A monument was originally erected to the declaration of peace at the end of World War One. 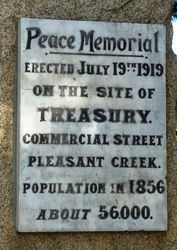 The memorial is built on the site of the original Pleasant Creek goldfields and was erected in 1919 after the end of the war. During the Back to Stawell celebrations on the 10th October 1922, the monument was formally handed over to the council in trust as a memorial to the old pioneers. This memorial was erected by volunteer labour at three working bees on 19th July, 26th July and 30th August 1919, on this site. Mr. Hooper, who owned the property, gave his permission for the erection of this memorial. At the first two working bees, stones from the original old treasury near this site were built into a solid base about four feet high, consisting of three different levels. At the third working bee, the granite obelisk, seven feet high, carrying a marble tablet, suitably inscribed was put in place on top of the base. This obelisk was donated by Robson & Gray, monumental masons. The memorial was unveiled on October 10th 1922 by the Mayor of Stawell, Cr. J. Paton. Cr. David Williams who accepted the memorial on behalf of the Shire.